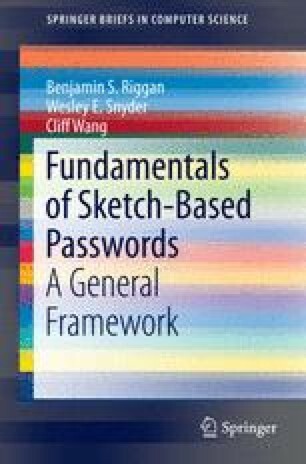 The main objective of this chapter is to summarize the authors’ recent work which studied the human-computer interaction for sketch-based passwords. However, before discussing the previous results, the features used specifically for implementation of SKS are discussed, and an overview of the database used for the HCI study (and some experiments and results in the subsequent chapter) is provided. The features used for the application of sketch-based passwords incorporates four fundamental properties: (1) shape, (2) direction, (3) order, and (4) pressure, which comprise a local 5D feature descriptor at every sketch sample point. The database used for this HCI study was constructed by the authors in (Riggan et al., A human factors study of graphical passwords using biometrics. Proc. of the 36th German Conf. on Pattern Recognition, 2014). This database considers a sufficiently large and complete set of users and many variations of sketch-based passwords. The previous HCI is useful to understand the connection between human perception and certain similarity measures, specifically for sketch-based authentication.